Ideally, daily nutritional needs should be met through healthy eating—but the typical diet does not always supply all the vitamins and minerals a body needs. So even in healthy people, multivitamins and other supplements may help prevent vitamin and mineral deficiencies and they can also provide more nutrients than diet alone, which may help to protect against or manage certain diseases. The following list gives the daily optimum amounts of nutrients that might benefit healthy people. The FDA-required fortification of grain products may have reduced deficiency in the general US population, but some authorities believe it is not enough to optimally prevent diseases such as heart disease and neural tube defects. The body’s need for folic acid doubles during pregnancy. Supplementation prior to, and shortly after, conception is adequate and effective. A common deficiency in developing countries, iodine is more abundant in Western diets. Most people get enough unless they avoid iodized salt, seafood, and sea vegetables. People with thyroid diseases should check with their doctor before using iodine supplements. The synthetic beta-carotene in most multivitamins clearly does not prevent cancer and may increase the risk of lung cancer in smokers. In contrast, however, natural beta-carotene and several other carotenoids may help prevent certain diseases, including some cancers, although its safety for smokers has not been demonstrated. Due to concerns about birth defects and bone loss, people should not take over 10,000 IU of supplemental vitamin A in the form of retinol without consulting a doctor. The typical Western diet may provide thiamine (B1; 1.5 mg), riboflavin (B2; 1.7 mg), and niacin (B3; 20 mg) in adequate amounts as they are added to white flour products and other foods that have been depleted of those vitamins. Biotin (300 mcg): This vitamin is produced by intestinal bacteria in amounts that, along with the typical diet, provide enough to prevent deficiency in healthy people. Pyridoxine (B6; 10 mg): Some deficiency may exist in as many of 25% of people living in Western societies, and may be most common in the elderly. Pantothenic acid (B5; 10 mg): This vitamin appears to be in short supply in the typical diet though its role in disease prevention is unknown. Vitamin B12 (5–100 mcg): Vitamin B12–deficiency is more common among the elderly than in healthy young people, except for vegans (vegetarians who avoid dairy and eggs) and in people who take acid-blocking drugs or antacids for long periods of time. Some people claim to experience improved mood, energy, and/or overall well-being when taking higher-than-RDA amounts of vitamin B1, vitamin B2, vitamin B3, and pantothenic acid, though this has not been demonstrated in research. Folic acid, B12, and pyridoxine help control homocysteine levels in the blood. Elevated homocysteine levels are associated with several diseases. Studies have shown that supplementing with one or more of these vitamins helps prevent or reverse hardening of the arteries (atherosclerosis) and may reduce bone fractures risk. Severe deficiency is uncommon in people who consume Western diets, but mild insufficiency is found in 6% of healthy adults and larger numbers of college students and smokers. Some authorities have suggested that optimal intake for disease prevention may be at least 90 to 100 mg per day. Supplementation with over 200 mg per day of vitamin C by healthy people does not result in higher vitamin C concentrations in the body, and may be no more helpful for preventing disease than smaller amounts. Though toxic in very high amounts, up to 2,000 IU per day is considered safe. Once widely thought to lower risk of heart disease, other trials have negated those findings and even found a small increase in the likelihood of all-cause mortality or heart failure. Therefore, some doctors advise people not to take large amounts of vitamin E (400 IU per day or more). On the other hand, circumstantial evidence suggests that “mixed tocopherols,” as opposed to the more widely used alpha-tocopherol form, may be safer and more beneficial for heart-disease prevention. A reduced risk of prostate cancer in smokers was reported in a double-blind trial with 50 IU per day of vitamin E. However, similar studies have not found vitamin E supplements to protect against other cancers. Vitamin K (80 mcg): Deficiency severe enough to cause bleeding problems is rare in healthy people. However, low vitamin K in the blood and in the diet has been associated with osteoporosis. A common deficiency in the US, especially among women, good calcium nutrition throughout life is essential for achieving peak bone mass and preventing bone loss and risk of bone fractures. Calcium’s protective effect on bone is one of the few FDA-approved health claims. Because of challenges in measuring the amount of chromium in foods and the human body, there is disagreement about the extent of deficiency in Western societies. Deficiency has been associated with blood sugar and cholesterol abnormalities, especially as people age. Although a causal relationship is doubtful, a few single case reports have described possible serious side effects in people taking large amounts, so people should stick to recommended amounts unless supervised by a doctor. While there is some indication that deficiency might be common in the US, the significance of this is unclear. It doesn’t usually cause obvious symptoms, though supplementing with copper may help prevent bone loss. Since zinc can interfere with copper absorption, copper should be taken whenever zinc supplements are taken for more than a few weeks. Due to a rare condition that causes iron to accumulate to toxic levels in the body and also due to the association of high iron levels with some serious diseases, people should avoid iron supplements unless they have been diagnosed with iron deficiency. Groups at risk of iron deficiency include some vegetarians, menstruating girls and women, pregnant women, and female and adolescent athletes. Magnesium (250–400 mg): Dietary deficiency may occur in up to 25% of adult women in the US and in even higher numbers of elderly people of both sexes, affecting bone health, among other effects. While a typical diet provides enough for most people, those who eat a lot of refined and processed foods may be deficient as manganese and other trace minerals are often low in these foods. Deficiency has been associated with bone loss. Manganese may be especially important to include when supplementing iron, since iron can reduce its absorption and deplete it from the body. Molybdenum (75 mcg): With a low potential for toxicity, little is known about human needs for this essential trace element. Deficiencies are rare and estimated requirements are based on what people typically receive in their diets. Selenium (50–200 mcg): Though most people get enough in their diets, supplementing with higher amounts of yeast-based selenium is associated with decreased risk of cancer death. The upper end of safe long-term intake is estimated to be 400 mcg per day for adults. Deficiency is relatively uncommon in Western countries, though supplements have prevented growth impairment in deficient children and have been shown to increase immune function in healthy people. (It isn’t known whether these changes prevent infection or disease). Too much zinc has been reported to impair immune function and some healthcare practitioners recommend no more than 30 to 50 mg per day. Regular supplementation should be accompanied by copper supplements to prevent copper deficiency. Phosphorus: Not included in most multivitamins because of its abundance in the diet. Elderly people, whose diets tend to be lower, may need supplementation. Calcium interferes with absorption, so older people taking calcium supplements might benefit from additional phosphorus. Potassium: Though severe deficiencies are uncommon in healthy people, some research suggests increased intake may help prevent high blood pressure and stroke. However, the maximum amount of potassium allowed in one pill (99 mg) is far below the recommended amounts (2,400 mg per day). 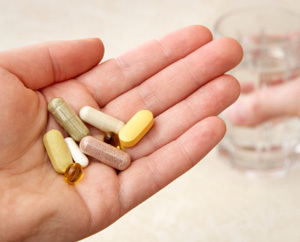 Multiple pills should not be taken in an attempt to get a higher amount, since they can irritate the stomach; instead, eat several daily servings of fruits and vegetables. Flavonoids: A class of nonessential nutrients, flavonoids have antioxidant and other properties and have been reported by some, though not all, researchers to be linked with a reduced risk of heart disease. Multivitamin supplements also frequently include other nutrients of uncertain benefit in the small amounts supplied, such as choline, inositol, and various amino acids. Who is more at risk for deficiencies? People who have lost weight may be deficient in a wide range of vitamins and minerals. Vegetarians are at risk to become low in protein, vitamin B12, iron, vitamin D, zinc, iodine, riboflavin, calcium, and selenium. Vegans need the same nutrients as vegetarians, but vegans are more likely than lacto-ovo (dairy-and-egg eating) vegetarians to be low in protein, selenium, and B12. People eating macrobiotic diet: Deficiencies of vitamin B12, iron, vitamin D and other nutrients have occurred. This diet should be supervised by a dietitian or doctor. Elderly people living in their own homes are often deficient in vitamin D, vitamin A, vitamin E, calcium, and zinc, and occasionally of vitamin B1 and vitamin B2. Premenopausal women have been found often to consume low amounts of calcium, iron, vitamin A, and vitamin C.
As natural substances, are supplements safer than drugs? Nutritional (and also herbal) supplements are not necessarily safer just because they are natural: Some might produce unwanted side effects when a person takes too much, and if you are taking medications, you should always check with your doctor or pharmacist before adding nutritional supplements or herbs to your self-care.